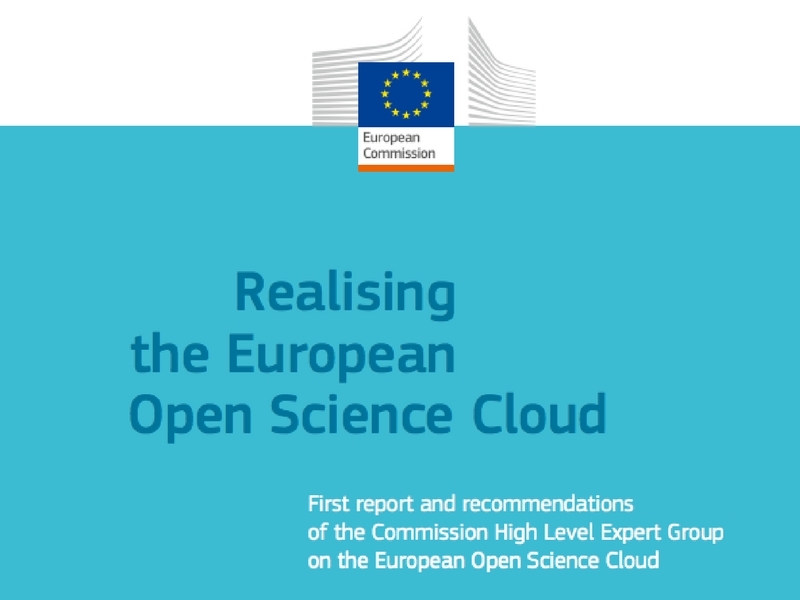 As outlined by Barend Mons (HLEG Chair) in the Preface, "This report aims to lay out a living guide for the realisation of the European Open Science Cloud (EOSC). The High Level Expert Group, with ten members from European countries, Japan and Australia, discussed extensively in several meetings, conferences, policy events and met with key stakeholders (30 November 2015) and research funders (15 March 2016). Based on these consultations, on many 'white papers' and on a range of presentations and feed-back at international meetings, we are confident that our recommendations count on a high-level of consensus amongst all stakeholders. This was a solid basis to embark on this challenging journey with the Commission, the Member States and International partners in concert." European Commissioner Carlos Moedas tasked its members, in September 2015, to explore what was then only an embryonic policy idea: the European Open Science Cloud, a future infrastructure to support Open Research Data and Open Science in Europe. Since then, the Commission made the idea a vision for the future of open science, in the context of the Digital Single Market. This group proposes an hourglass governance model that is lightweight yet effectively relying on minimal rigorous standards. The model would then “prevent costly and time consuming exercises to decide who has the best solutions” allowing instead for “participation from all stakeholders, including research infrastructure providers, Member States, research institutes and businesses”. The EOSC would then be framed as “the EU contribution to an internet of FAIR Data and Services”. Actions proposed are far reaching and embrace a number of core issues from the necessity to embark in a concerted effort to develop lacking core data expertise, to revise the funding scheme, from the need to implement new modes of scholarly communication and reward systems, to the need for federating existing gems and bringing the divide between different domains. The members of the EOSC HLEG are Paul Ayris, Jean-Yves Berthou, Rachel Bruce (Rapporteur), Stefanie Lindstaedt, Anna Monreale, Barend Mons (Chair), Yasuhiro Murayama (Observer, Japan), Caj Södergård, Klaus Tochtermann, Ross Wilkinson (Observer, Australia).